The company at the center of the salmonella outbreak that sickened more than 1,820 people during the summer and led to the recall of 550 million eggs has been cleared by the Food and Drug Administration to begin selling eggs for the table again. On Tuesday the FDA notified Wright County Egg LLC of Galt, Iowa, that it could begin shipping shell eggs from two of its 73 henhouses. The company has six egg farms in and around Galt, spokeswoman Hinda Mitchell says. Since August, the company has been under orders from the FDA to sell only to "breaker" facilities, where eggs are broken and processed to eliminate potential pathogens. "During the outbreak, I said that FDA would not agree to the sale of eggs to consumers from Wright County Egg until we had confidence that they could be shipped and consumed safely," FDA Commissioner Margaret Hamburg said in a statement. "After four months of intensive work by the company and oversight, testing and inspections by FDA, I am satisfied that time has come." In a letter to Austin DeCoster, the owner of Quality Egg LLC, which also does business as Wright County Egg, the FDA outlined the steps that the company has taken to clean up its henhouses, including testing for salmonella enteritidis and clearing up its rodent problem. In a statement, DeCoster said: "We recognize that we will have to continue to do more than is expected of us as we resume operations ... both to ensure our ongoing compliance with FDA regulations and to re-establish successful relationships with our customers." The FDA has conducted multiple on-site inspections, the most recent in October and November. Eggs from the two laying houses now cleared to sell shell eggs have tested negative for salmonella enteritidis, twice by the FDA and once by Wright County Egg. The company has agreed to test the houses every month. When the company was in full production before the first recall Aug. 13, it sold 3 million dozen eggs a week to the table egg market, Mitchell says. 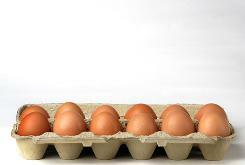 "Now we're going to be at about 71,000 dozen going to the table egg market."